Our product range includes a wide range of electric stacker for material handling. We have gained a great level of expertise in the field of manufacturing and selling Electric Stacker for Material Handling. 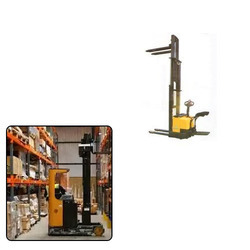 With the help of our excellent staff, we are able to manufacture finest quality of Stackers. These are basically used for Bulk Material Handling Operations and Intensive Multi-shift Operations. They are known for their durability, pollution free functioning, capacity of bearing heavy loads, safe operations and resistance to rust, scratches or wear. Our products meet the industry standards and are highly appreciated by our esteem clients. Looking for Electric Stacker for Material Handling ?